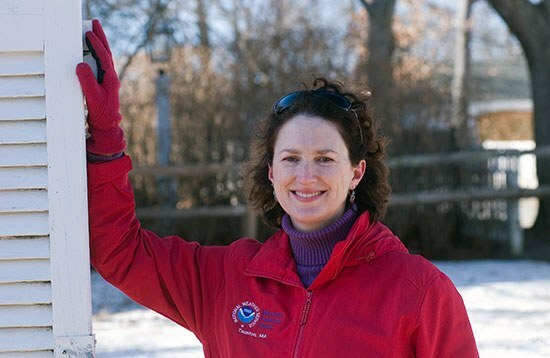 Kimberly Buttrick, Penn State Meteorology alumnus and a meteorologist with the National Weather Service Southern New England Forecast Office in Taunton, Mass., was recently awarded NOAA’s Isaac Cline Award in Hydrology for her outstanding leadership in revitalizing the region’s arm of the NWS Cooperative Observer Program (COOP). George Washington and Thomas Jefferson loved doing it. So did Benjamin Franklin. Now, a NOAA scientist is helping citizen volunteers do it too. That something is the daily ritual of ensuring the day’s weather makes it into the history books. Although we don’t often think of it this way, weather observation is a national pastime of sorts — and for the weather-obsessed, it can be pure bliss.